Emily Thornberry – how low will the bar for political resignations go? 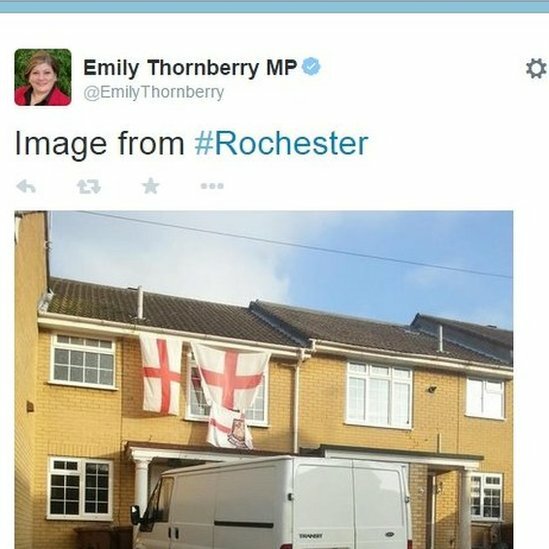 Emily Thornberry was an excellent Shadow Attorney-General. Actually, I don’t know whether that is true. But she was well qualified for it, having been a successful human rights barrister. She has had a successful career as a Parliamentarian, fighting for causes she believes in, and being prepared to vote against her own party (particularly on civil liberties issues when they were in government). She emerged squeaky clean from the expenses scandal too. Yesterday, she was forced to resign, because she tweeted the above picture. Yes, that’s it. After another day of confected political rage, Emily Thornberry had to resign from the shadow cabinet because the picture above was considered “snobby” and “sneering”. Given the low number of Labour votes in Rochester and Strood, this story feeds oxygen to the major criticism of Ed Miliband and his band of followers that was made by Jason Cowley, the editor of the left-wing New Statesman last week. “Miliband is very much an old-style Hampstead socialist. He doesn’t really understand the lower middle class or material aspiration. He doesn’t understand Essex Man or Woman.” This criticism really hit home – which is probably why, when Thornberry tweeted what she did, his reaction was so severe. She lives in a £3 million house in Islington, for which you can easily swap in for Hampstead. Is the Labour Party SO terrified of losing votes now that they are going to jettison people on their front bench for something like this? Isobel Hardman of the Spectator pointed out that by allowing her to resign, by allowing this story to blow up as it did, Labour have ended up filling the front pages, instead of what should have happened, if you were a Labour supporter – which is headlines about UKIP winning another seat over the Conservatives. Furthermore, “This sets the bar ridiculously low for resignations from the Labour Party Front bench” was James Forsyth of the Spectator’s comment. He says that every single even slightly controversial tweet from a Labour front bencher will be followed by calls for a resignation and questions for Ed Miliband about why he hasn’t sacked that person. This once again takes attention away from their policies and their criticisms of Tory policies. Make no mistake, there are seasoned journalists who are genuinely scratching their heads over this furore. They don’t understand why there was such an uproar, apart from those opportunistic UKIP and Tory politicians who wanted to make hay with anyone who they think might possibly be not sharing their world view. They can’t understand why Miliband effectively sacked Thornberry – and why Labour are allowing stories to come out saying that he has “never been so angry”. Really? There is a massive cost of living crisis, people on zero hours contracts and THIS is what makes you angry?